Are you planning to get a skip for your house, apartment or property? If yes, you’ve probably gone through the maze that is choosing the right skip size that suits your needs. If it just a replacement for another skip, the choosing process will most likely be a walk in the park for you. But not all folks find it easy. Some just don’t have the time to research it, while others don’t get the whole skip size thing at all. The reality is that it is necessary to know the size you need before you buy, so as to avoid uninformed choices. You might find yourself with a skip that can only take half your rubbish in one filling, leaving you with a mess on your hands. What are skips and what are they used for? Some may call it a dumpster, but the more common name used for those big bins that hold large amounts of rubbish for removal is ‘skip’. Like in other parts of the world, these bins are common in Australia and mainly used by homes for doing away with large amounts of household waste at ago. Homeowners place the rubbish in the usual black bags which they then pile into the skip over a period of time. The maximum number of bags that can fit in a skip ranges from 20 to over 100 bags, depending on the size of the skip used. Skips are commonly provided by the companies that provide waste pick-up services. 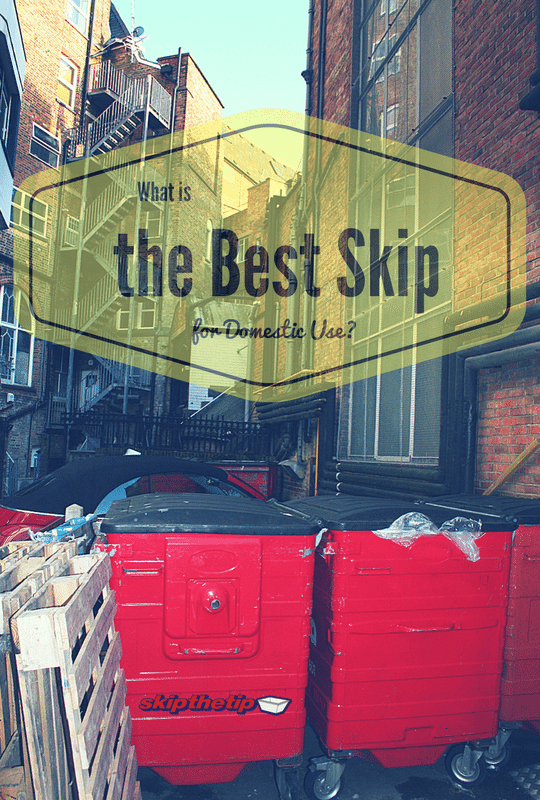 Skips are used both commercially and domestically. Commercially, the commonest uses include collecting large amounts of solid waste in wide areas such as cities and transporting materials up and down on large construction sites. Typically, commercial skips are larger in size when compared to those intended for domestic use. Our emphasis is on the skips for domestic use, though. To determine the best skip size for domestic use, you must first understand the needs you have before determining whether buying a skip of any size would be a realistic endeavour. Most times, the need for a skip comes from having a lot of rubbish or waste that cannot be carried in the car for dropping away or kept in everyday bags for long. Collecting garden waste such as leaves and tree branches in the autumn. Clearing out waste from house rooms such as garages. Small building projects such as kitchen and bathroom renovation. House moving and the rubbish involved. And much more like these. So, what skip sizes are available? Skips come in many sizes. Manufacturers have always understood that skip requirements differ everywhere and have various lengths and breadths available with everyone in mind. Preferably, skips are measured in cubic metres. One cubic metre represents 1m×1m×1m and is about the amount of rubbish you’d fit onto a standard trailer. The sizes are categorised according to as small, medium, large or very large. The specifications of each skip vary according to the manufacturer but are always in a common range. Ideal for small domestic jobs and renovations. Most come with doors for easier loading of waste. Ideal for house renovation and large garden projects. There are many other skip sizes, most of them larger than the above. Only those good for domestic use have been listed. Some skip sizes such as the 10 cubic metre skip are large enough to hold 10 trailer loads of rubbish, but take up a lot of space. Some city rules and regulations have a limit on the size of the skip that can be placed on the street. To avoid the permit hassles that comes with all this, you may have to place it in your driveway. Some companies charge different fees per size for pick up. Also, the price of the skip is fixed, regardless of whether or not you fill it up. Depending on the size specifications above and the domestic requirements you have for a skip, the choice is best left to you. You might have lots of garden waste or have a small house construction project, such as kitchen renovation or wall construction coming up. Both activities require different sizes of skip, but can always be dealt with using a large enough skip. That is why the medium range is our ideal skip size for the average home. The rubbish or waste generated by homes can vary according to a number of factors, chief among them the size of the house or property and the activities that take place there. Smaller houses or those with less waste generating activities will require skips on the lower end of the size range. On the contrary, larger houses and properties and those with more waste generating activities taking place in them will have much to use a skip for. As such, their ideal size would be one of the larger 10 trailer loads-or-more skip sizes. The medium size range is ideal for the average home with everyday activities that create daily amounts of waste. It is not too big to require filling for a long time or too small to warrant another quickly after the first is filled up. Its sizing is just right for everyday home waste accumulation. Here’s why the skips in this range are the best for domestic use. They can carry a good amount of rubbish, ranging from 5 – 8 trailer loads. They come with doors for easy wheeling in of heavy waste such as soil and rubble. They fit easily on most streets and driveways. Some, depending on the manufacturer, have top lids for covering. They are cheaper in comparison to the larger skip sizes. What can you use this skip size for?